The railway boom during the middle of the 19th century marked a revolution in transport. The railways became the new arteries of the nation, partially bypassing the already established waterways and canals which were clogged up by the ever increasing demand for raw materials and manufactured goods. The building of railway lines peaked in 1846 when 273 separate acts of parliament were passed for the building of new railway lines. The growing railway networks created a massive number of jobs on the newly built railway lines. Working on the railways in the 19th century was hard. Workers laboured regularly for 12 hours a day and risked injury through unsafe conditions. Many small union groups formed in an attempt to improve conditions on the growing rail network. 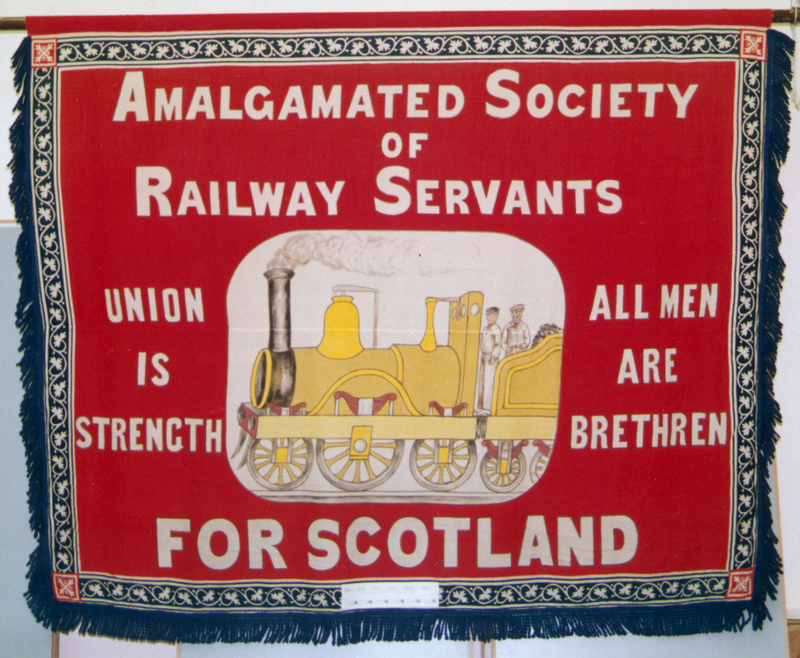 Several early strikes failed before the Amalgamated Society of Railway Servants (ASRS) formed in 1872. Railway bosses fought the growing union by paying drivers higher wages, if they agreed not join a union. The ASRS formed just after the 1871 Trade Union Act which gave trade unions immunity from prosecution for conspiracy, register legally and provide protection for their funds. This ASRS banner is a replica of one made in the late 19th century, which is in too poor a condition to display. The replica is currently on display until the New Year. The ASRS joined with two other railway unions to form the National Union of Railwaymen (NUR) in 1913, a year when passenger numbers peaked. The NUR became one of Britain’s biggest trade unions with over half a million members. This entry was posted in PHM Collection and tagged Amalgamated Society of Railway Servants, People's History Museum, Railways, Trains. Bookmark the permalink.